Home Is Where The Political Heart Is – Or Is It? Jack Goodman, consumer of all things political and purveyor of great blog post ideas, recently sent me the link to this entertaining exercise hosted by the Washingtonian magazine that attempts to determine where you should live based on your politics. If you click the link, you’ll come across a series of eight agree/disagree questions pertaining to a variety of lifestyle choice and beliefs. Based on your responses, the program’s algorithm purports to tell you where you should live, within a particular state, according to your political views. The exercise brings to mind Bill Bishop and Robert Cushing’s widely publicized 2008 book The Big Sort. In it the authors argue that during the previous three decades Americans were increasingly sorting themselves into politically like-minded communities. They did so not on the basis of overt partisan calculations, but due to life-style choices that produced, as a byproduct, more politically homogenous communities. As evidence, the authors note that in 1976 only about a quarter of American voters lived in a county in which a presidential candidate won by a “landslide” margin, that is, with 60% or more of the vote – an indication of a dominant political perspective. 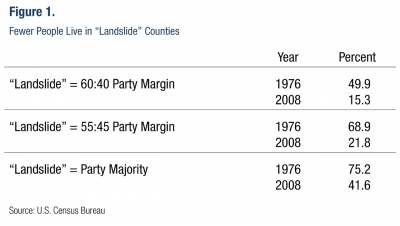 By 2004, however, the number of landslide counties had swelled to nearly half of all counties. The trend toward a more uniform political outlook within communities, they believe, has contributed to the growth in political polarization that has again become such a hot topic thanks in part to the recently released Pew report I’ve discussed in previous posts. More importantly, questions like those in the Washingtonian exercise, or in the recently released Pew survey on political polarization, that ask where we prefer to live based, in part, on political preferences, aren’t very good at telling us where we actually live. That is because as Clayton Nall and Jonathan Mummolo show in this paper people’s residential choices are constrained by more fundamental concerns with factors such as crime rates, the quality of the schools and proximity to one’s job. In this regard, people may express a partisan preference on surveys in terms of where they would like to live, but that preference is rarely going to determine their actual choice of a home. So we should be wary of using respondents’ answers to survey questions regarding where they would prefer to live as evidence of increasing political polarization. Note also that survey results based on dichotomous choices, such as the agree/disagree option in the Washingtonian exercise, don’t do a very good job at capturing the complexity of individuals’ political views. Thus, asking whether one agrees or disagrees with the statement “Abortion should be legal and accessible to all women” won’t come close to capturing what most Americans think about this issue, based on other survey data that gives respondents more options. And we can start with me – the algorithm didn’t come close to getting my residence location correct. And that is because I live here in God’s Green Hills not because of any affinity with my neighbors’ political views – indeed, I have very few neighbors in my very rural community to bother me. Instead, I have an abundance of swimming holes, hiking trails, woodchucks and, not least, stones. And stone walls, after all, make good neighbors. And woodchucks never question my political views. They just eat my garden.